If you have a friend or relative who loves jumping cross-country then why not give them an entertaining and practical Christmas gift that they will really appreciate, a ‘Petplan Masterclass with Lucinda’ DVD presented by Horse & Country TV in association with Petplan Equine, the UK’s leading specialist equine insurance provider. 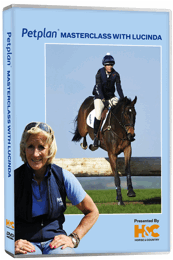 The DVD features one of the true legends of equestrian sport, six times Badminton winner Lucinda Green MBE who shares her lifetime of experience in coaching riders of all abilities to develop their technique and confidence as they tackle a range of fences from ditches, drops and steps to water, corners and skinnies. At the heart of Lucinda’s philosophy are the principles of safety and the development of mutual confidence between horse and rider,which is reflected throughout the DVD. Petplan Masterclass with Lucinda is the perfect gift this Christmas if you want to help a friend equip themselves with the skills to see them safely across the country and the opportunity to learn from someone who is at once one of the world’s most successful event riders and a highly regarded coach. The retail price is £19.99.